The Modern Quilt Guild invited all bloggers attending QuiltCon to join the QuiltCon Link Party and list five unknown personal facts about ourselves for a virtual meet & greet. So here it goes. 1) I shaved my head for two Summers in 2006 & 2007. Ever since I saw the Sinéad O'Conner CD cover back in the 80's I wanted to see what it would be like to sport a bald look. 2) I was a majorette as a pre-teen. I picked up my love of baton twirling again in my 40's when I joined the Scene Of The Crime Rovers, a very cool alternative marching band, in Durham, NC, made up of a lot of middle-agers like me re-envisioning their high school band days. 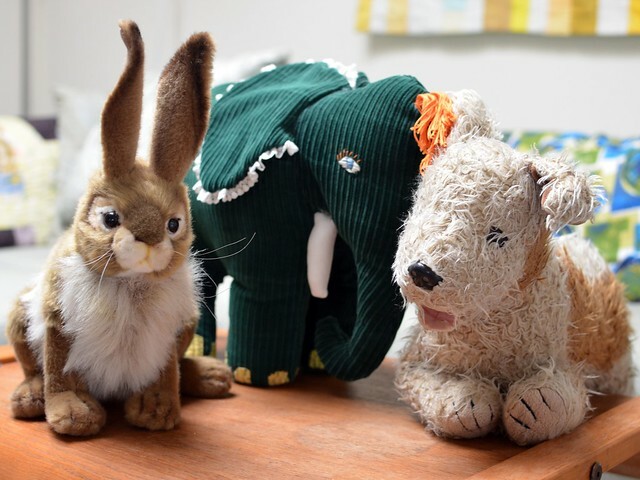 3) I live with three very lovable stuffed animals that care for me dearly ;) Jelly Bean the rabbit (JB for short), CoCo Crisp the green corduroy elephant with yellow toe nails, and Curtis the curly-haired dog. Aren't they adorable! 4) I was a divinity school drop out from Emory University in my 20's. I wanted to be a minister. After I dropped out I started making quilts. Eight years later I submitted a series of quilts based on sacred texts and theological ideas for my thesis, and received a Masters of Theological Studies. The quilt above is called The Empty Tomb and it's huge. 5) One of my favorite things to do is ride my bike. When I moved to San Francisco I built Frankie (short for Frankenstein) - made entirely from scratch with used and discarded bicycle parts -- at the Bike Kitchen. Follow me on Twitter, send me a message and I will follow you back. I will be tweeting my whereabouts during the conference. Or follow me on Facebook. If you aren't on either -- my Twitter feed shows up on my sidebar, and you don't need to be a member of Facebook to view my FB page. When I'm not teaching classes and be-bopping around, you may find me at the Modern Quilt Guild booth. This will be my home base since I'm not affiliated with any commercial entity. Even if I'm not there leave me a note or pick up a card with my contact info. Or take a flyer about my workshop offerings to bring back to your guild. No, QuiltCon is providing sewing machines for all workshop participants. How much fabric should I bring for the workshop? Improv Round Robin: A tote bag of scraps will do, plus one yard of a single signature fabric. Include whatever fabrics you want YOUR quilt to be made with. From the materials you provide, others in the class will choose what and how they want to add to your quilt. Also each person will add one fabric of their own to your quilt (that's what you will use your 1 yd of signature fabric for - to add a little bit to all the other quilts you work on). A range of values is more important than a range of colors. Modern Block Improv & Get Your Curve On: For each of these workshops, consider how fast you sew and how much you can sew in 6 hours. You can make your quilt a mini or you can work large it's up to you. Then bring the amount that seems suitable. Just be sure to have enough range to be creative with. There are no set amounts. Consider what is right for you. If your materials are more restrictive that's okay - it only means that you may have to push yourself to be more inventive. If you're attending QuiltCon, I would love to hear from you in the comments so I can keep an eye out for you. If you can't make it, I will be blogging about it when I get home - along with plenty of other folks I'm sure, for your virtual fix.